Throughout history, we have seen governments unlink the association of paper money from the value of gold and silver. The direct result of that is that we have seen many of these governments collapse along with their economy. Silver has always been recognized as a symbol for currency for thousands of years and will continue to be even in an economic collapse. So it is important to know the best silver coins to buy for survival. In the early 1900’s Germany used a currency known as the Goldmark. This is essentially the same as the United States gold standard. That means, at one point Germans were able to trade in a Goldmark in return for gold. After 1914 Germans could no longer do that. Their government unlinked the value of gold that was associated with the Goldmark. It then became known as the Papiermark which is a fiat currency. Afterwards, the German government liberally printed enormous amounts of the Papiermark in an attempt to pay their war debts. This caused inflation to skyrocket in Germany which eventually led to a collapse of their currency and economy. Their currency no longer held any value and could not be accepted anywhere else. Many Germans plummeted into poverty and struggled to survive. We have seen this happen throughout history with every government that printed a fiat paper currency. The United States is on this same track. In the early 1900’s, the United States strayed away from the gold standard. This gave politicians the liberty to freely print an unlimited amount of paper money. When the government is tied to a gold standard they are limited to the amount of money that they can print. But when the money is no longer tied to something of value then they can freely print as much as they want. So as a result of that, we are seeing inflation continually increasing as the value of the dollar decreases. Is it a coincidence the value of the Chinese Yuan continues to increase as their purchase more gold and silver? Not at all. This is because their currency can be backed by something of value. In the United States, no one really knows how much gold is really in the federal reserve. Many people have called to audit the fed but have been repeatedly denied. The reality is that the United States is heading for an economic collapse just like every government that has relied on a fiat currency. In fact, we have seen a few scary moments with the Great Depression in the early 1900’s and The Great Recession in the early 2000’s. It is only a matter of time that history will repeat itself. This is why it is important to prepare for such a financial disaster which can have lasting effects on society. Once the economy collapses and the dollar loses value then people will turn to something of real value. One precious metal that stays consistent with inflation is silver. 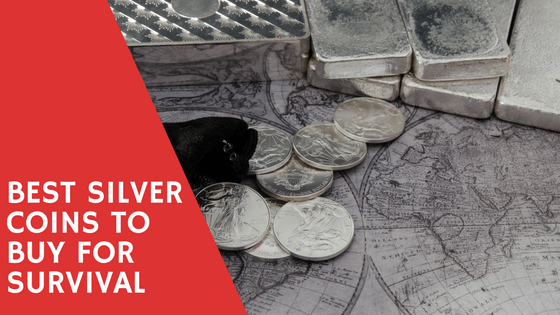 In a previous post, we discussed the important reasons why preppers should have silver. 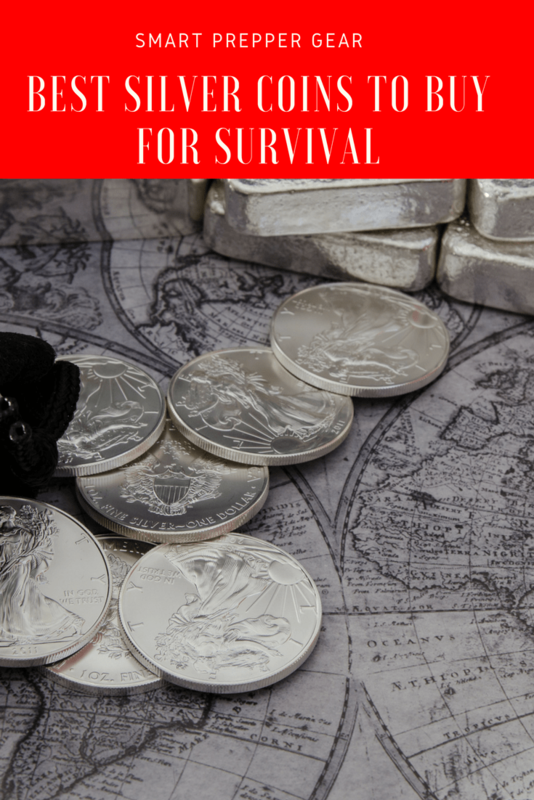 In this post, we are going to discuss the best silver coins to buy for survival. Before 1964, U.S. coins were produced with 90% silver. This mostly included dimes, quarters and half dollars. Today, these coins contain no silver at all. So during a collapse stores and others will most likely not be accepting newer coins for currency. If they do, then it won’t be much value as that of silver. Junk coins are widely recognized at stores because of their silver contents. Not only that but they are minted by the United States. Yes, you can produce fake coins but for the most part, you are able to identify a fake junk silver coin. With most of the coins, you can see that they are old. Fake coins will most likely appear newer. So when the economy collapses stores will turn away from the paper dollar and only accept something of value. You will want to have smaller denominations in junk silver. That way if something is only 5 cents then you are not giving them a quarter. It may be harder to receive change from stores as there will be a limited supply. So with smaller denominations, you won’t be losing as much. Junk coins can be found in a lot of places. They can be found in your change drawer or from stores. However, a lot of people are collecting a lot of these coins for the same reason. So you may want to find a dealer. I use SD Bullion for my junk coins. They provide you with a bag to keep these coins in. You should have a separate bag for each denomination. After junk silver, Silver Eagles will be the most recognized silver coin. This again is because it is minted from the U.S. government. So many people know that the coin holds 99.9% silver. Now they will probably a lot more challenging to use at stores. There is a possibility that stores will accept these coins because they are hard to create fakes. If not though, you can always get the melt value of the coin. You could also use them while bartering. However, this may also be challenging because most people that are bartering will be searching for items that they can survive off of. I doubt survivors of the collapse will be looking for silver coins. Instead, they will be focusing on their basic needs of survival. When purchasing Silver Eagles you will want to buy from a place with small premiums. This means you should look to buy these coins close to spot value or melt value. SD Bullion does provide some of the cheapest premiums that I have found. They also allow you to buy smaller purchases. Most bullion dealers require that you buy at least $100 worth at a time. Another option is to visit local coin dealers in your neighborhood. However, they have larger premiums and are not close to spot. Another great way to buy silver coins closer to spot is by making bigger purchases. Most bullion dealers have a smaller premium for bigger purchases. However, I’m not saying that you should max out your credit card. I recommend saving up money over time so that you can make a larger purchase. Another great way to find best silver coins for survival is to search online directories like Craigslist or eBay. You can find individual dealers who are looking to offload their stack quickly. Typically they will sell them closer to the spot price. So in my opinion, the best silver coins to buy for survival is junk silver and Silver Eagles. If you have any feedback or suggestions then please leave those in the comment section below. If you have any questions about SD Bullion then feel free to reach out to me. Your feedback will help the community prepare the smart way now so that we can thrive later.